A mixed use shopping centre is being proposed for a redevelopment of the PCL site opposite the Association’s hall on the corner of Don Buck and Red Hills Road. Established in 1950s, for over half a century the Poultyman’s Coop Ltd site has provided feed and grain for countless millions of chooks throughout North Auckland. 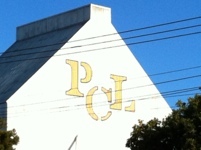 For some time the community has been aware of plans to sell the property, as PCL move to consolidate their feed operation at their existing South Auckland plant. Rumors of possible land use have included a high density residential development or a custodial Bad Boy facility operated by the Justice Department. However it now seems likely the 4.5 ha (10 acre) site is destined to become yet another Westie commercial hub, with shops and offices. Although nothing has yet been cast in concrete, the Association has already flagged the development a potential troublespot with an increase in traffic around an area that already has, with several schools within the immediate vicinity, a high population of children. 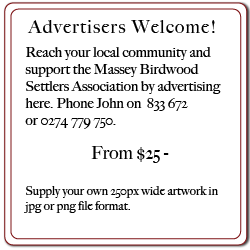 As more information comes to hand we shall do our best to keep our community informed.